Everyone’s favorite Mississippi Maven, Cece Fourchy, is back and she’s taking a cue from our June waterfront homes issue. Check out some of her favorite spots for outdoor dining and you’ll be packing up a picnic before you reach the end of this post! For this post, I was truly inspired by the Outdoor Living theme of the latest issue of At Home. In the coming weeks, I plan on soaking up summer for all it’s worth: lounging, tanning, gardening and taking plenty of evening strolls. While all of these things are sure to give me my open air fix, what I’m looking forward to most about the approaching summer nights is dining al fresco.Â I love the idea of treating the garden or patio as an extension of home, especially when it comes to decor.Â A fabulous tablescape, the right lighting and atmosphere can take an outdoor dining space to the next level. 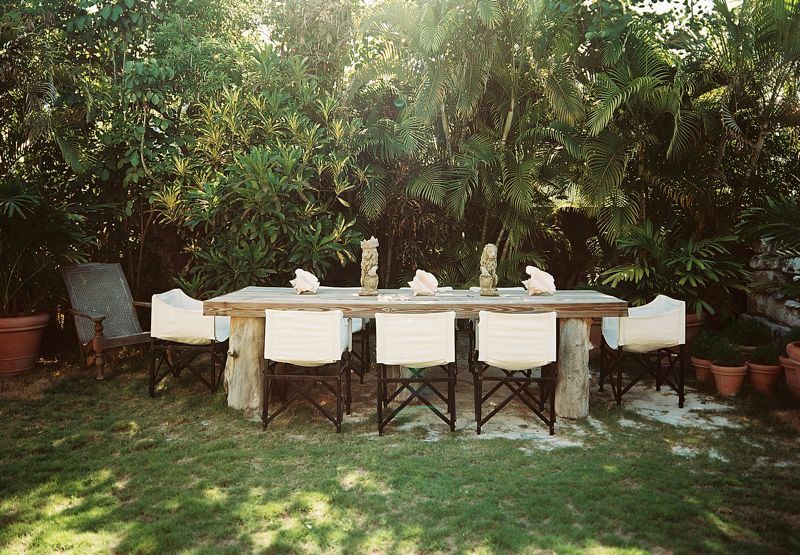 I’ve rounded up some of my favorite outdoor dining spaces for a little inspiration. 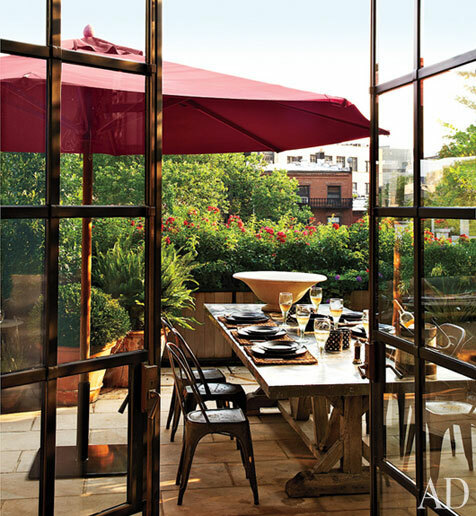 Chic and sophisticated with the perfect dose of masculinity, this terrace scene from Architectural DigestÂ has it all. I can only imagine what fabulous dinner parties have occurred here. For only the most glamorous of meals, this stunning setup flaunts cozy couches and brightly colored cushions. I’m sold! Casual and comfortable, this garden arrangement from House BeautifulÂ is the perfect setting for a posh picnic. 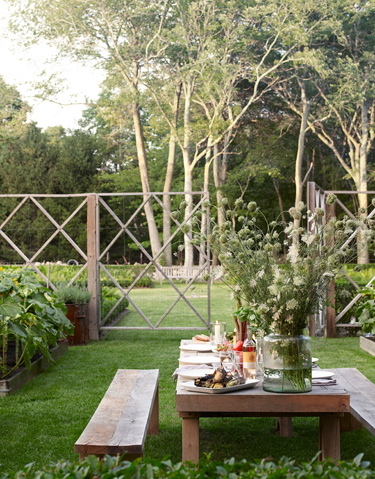 Wild blooms and rustic benches set the scene while guests savor organic veggies and crisp white wine. Sigh. A dramatic light fixture instantly turns this patio into a room of its own. Comfortable chairs, lovely foliage and spanish tile flooring complete this fabulous space from Sunset Magazine. 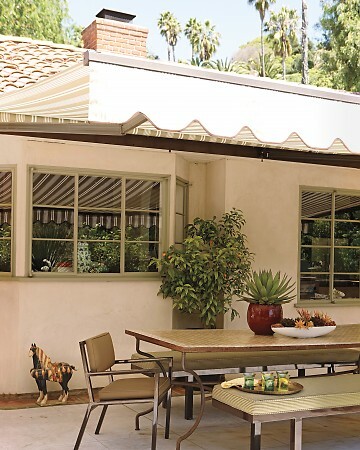 A modern take on the al fresco idea, this Martha StewartÂ dining space boasts streamlined furniture and a sleek awning so you’ll be made in the shade. 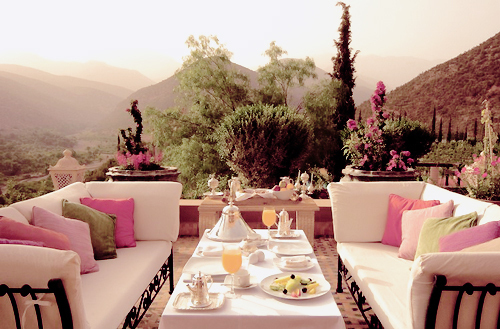 “I’ll take my mimosa on the terrace please”. David Flint Wood brings a beachy look to the concept with this LonnyÂ shot. I love the combination of that heavy table and those soft chairs. 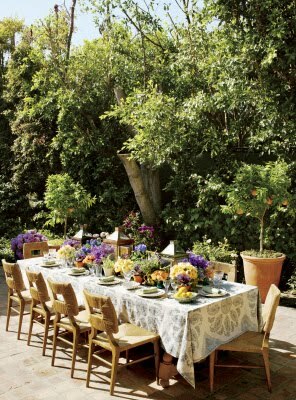 Last but not least, Jennifer Garner’s abundant patio dining room from Vogue Living is simply perfect: vibrant flowers and a printed tablecloth are both fresh and fun, while the modern chairs bring a tailored touch. I am definitely attempting to recreate this myself this summer! 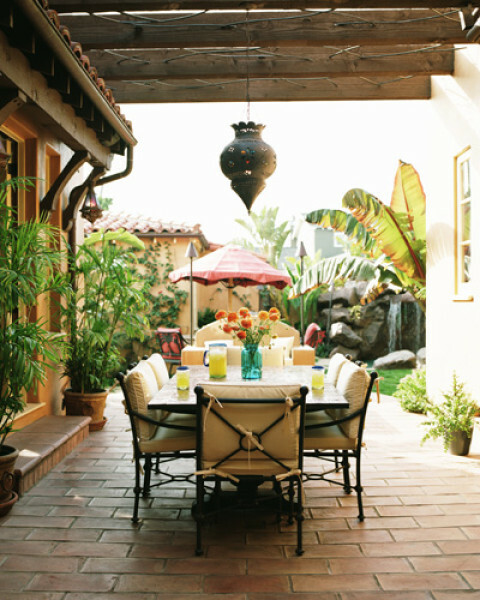 Which outdoor dining space is your favorite? When contemplating this month’s post, I couldn’t help but think of the current Family Homes issue ofÂ At Home. There are so many things to think about when designing a home for a family: a great kitchen, plenty of storage, kid-friendly fabrics, a trampoline in the backyard (or in the playroom, depending on how adventurous you’re feeling). As one of four children, my bedroom was my sanctuary growing up, my only place for privacy and obviously my favorite spot in the house. I still love my girly furniture, ruffled bedding and floral curtains. The little ones grow up fast (at least that’s what I’m told) so my vote is, let girls be girls! Let them have pink walls and stuffed animals as decor. There will be time for clean lines and modern furnishings when she’s older. Of course, there is a fine line between girly girl-chic and over the top. So, I’ve gathered my favorite pretty in pink girl’s rooms for a little inspiration. Leave it to India Hicks to create a perfect girl’s room. 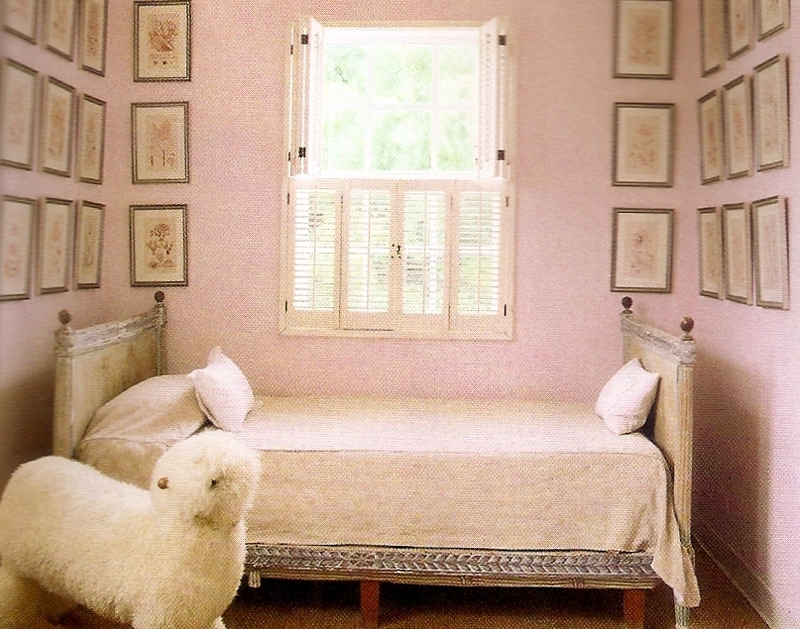 I love the pale pink walls, antique bed and furry friend. Featured in Veranda. 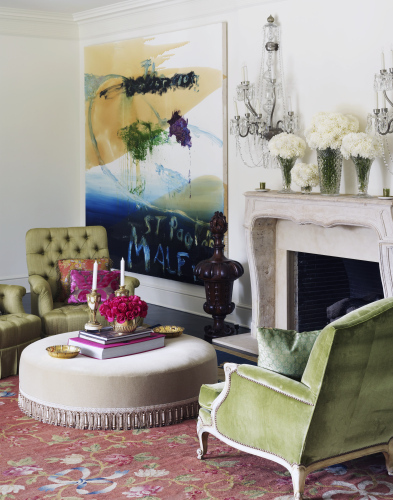 Mary McDonald gives pink and green a stylish spin in this room. It has a childish feel with grown-up touches. 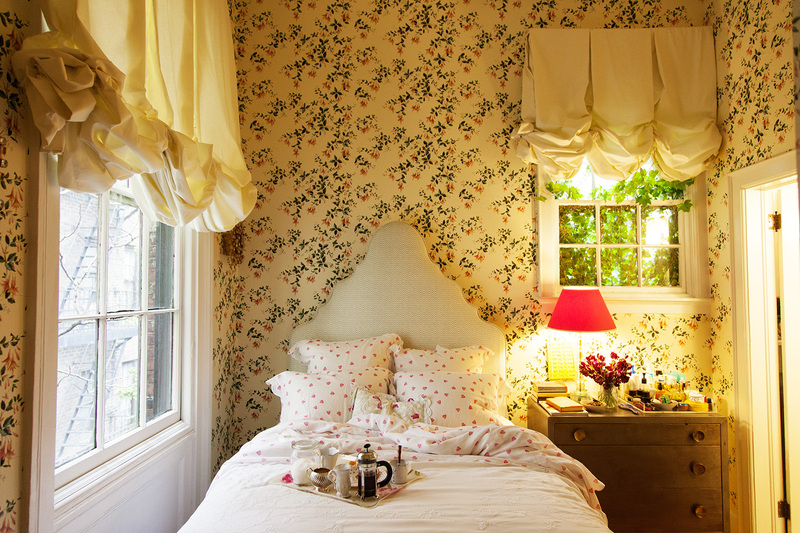 Amanda Peet’s daughter’s room combines vintage textiles with quirky touches, like the shocking pink Funny Girl poster. This space will easily make the transition from girlhood to the teenage years. From Domino. 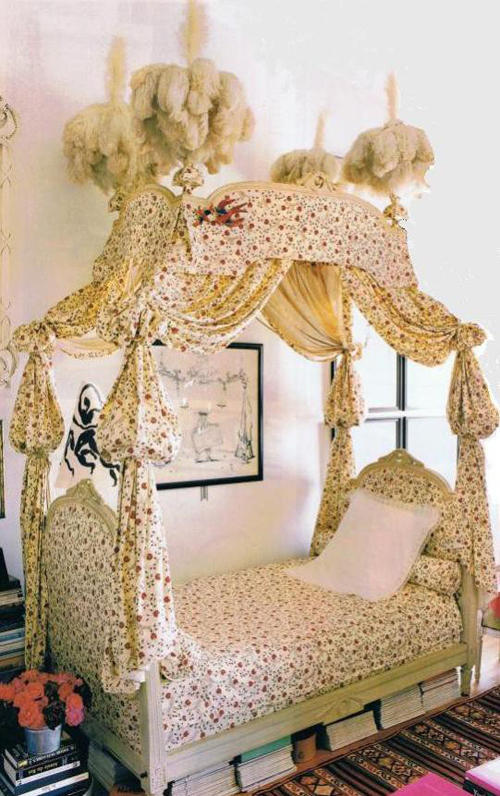 Pierre Herve may not have chosen this bed for a child, but isn’t it fit for a little princess? I would have spent hours curled up in it reading Nancy Drew. From House & Garden. An antique bed and a contemporary desk combine perfectly in this girly scene from the Novogratz design duo. A dress form and chandelier are feminine without being over the top. Love this look for a teenager. From here. Classic and polished with a slight touch of whimsy, this little girl’s room from Lonny is a little slice of heaven. Last but not least. this pastel bedroom is what girly-chic is all about: floral fabrics, a canopy bed, quirky touches (the eiffel tower and the hat collection) and a pretty palette. What more could a girl ask for? From Domino. The kitchens and baths in the September issue of At HomeÂ remind me that functional spaces can and should be just as stylish as other parts of the house. There is nothing wrong with an industrial, modern look in these kind of spaces, but it just doesn’t speak to my whimsical, romantic side. For example, showers often have a modern, streamlined feel; where getting clean is all about clean lines. That’s why, aesthetically speaking, I prefer a tub. Old-world and comforting, they are romantic, relaxed, and I can’t get enough. Who doesn’t love a good soak? And why not do it in style? For this month’s column, I’ve selected the top tubs, and these stylish spas do not disappoint. 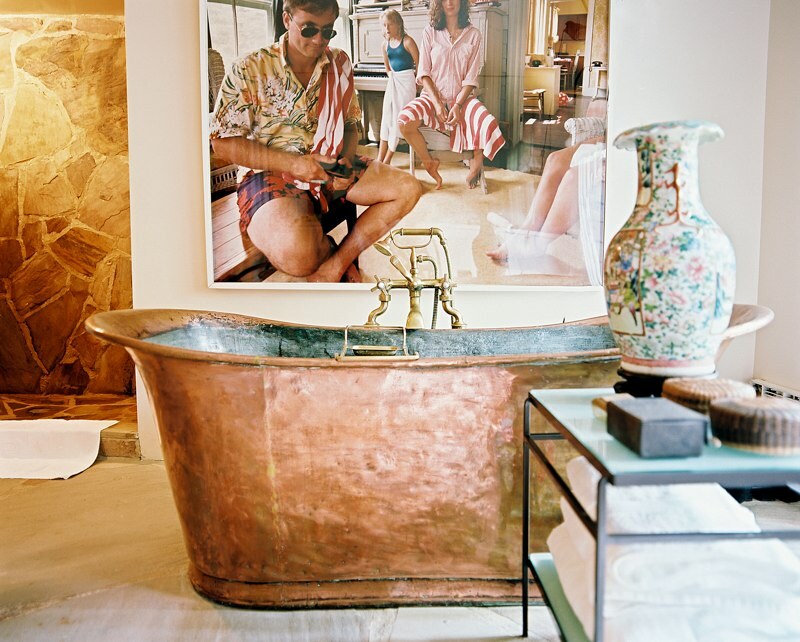 From Lonny, this super chic copper tub is perfectly complemented with large-scale art and a traditional vase. I could get cozy here. 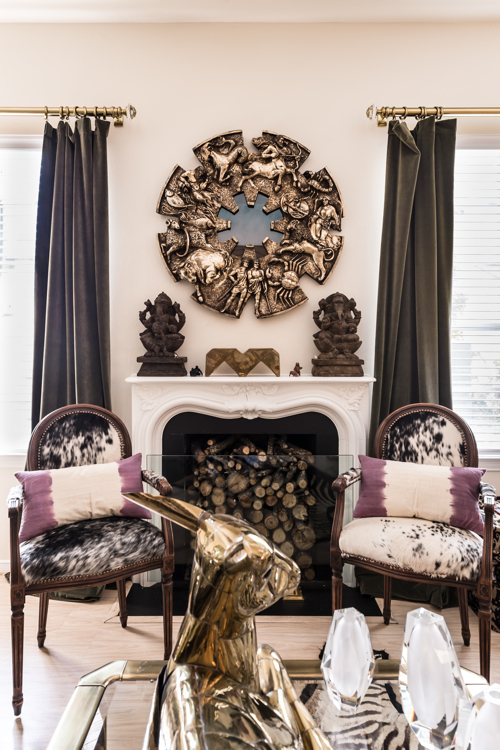 Leave it to Betty Lou Phillips to create the perfect parisian sanctuary, featured in House Beautiful. The pink towels and grand mirror are romantic touches. 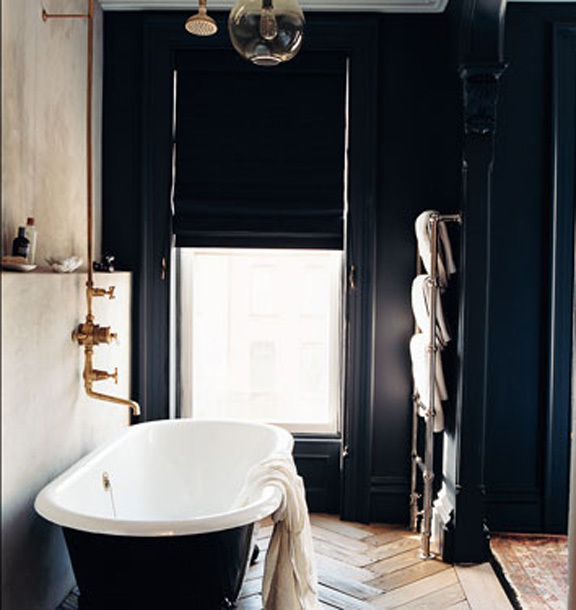 You can never go wrong with black and white, which Jenna Lyons proved in creating her bathroom. How chic would you feel soaking in this?? From Domino. 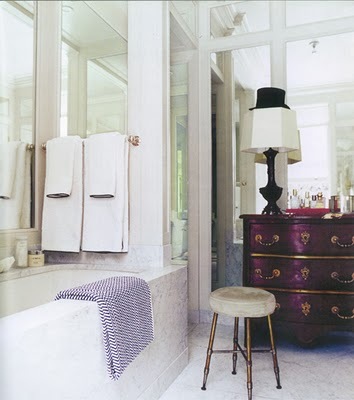 Miles Redd brings sophistication to the bath with this space. That velvet covered stool and those mirrored walls….I’ll take it! While Kate Spade’s guest bathroom actually has a tub/shower, it is the best of both worlds. 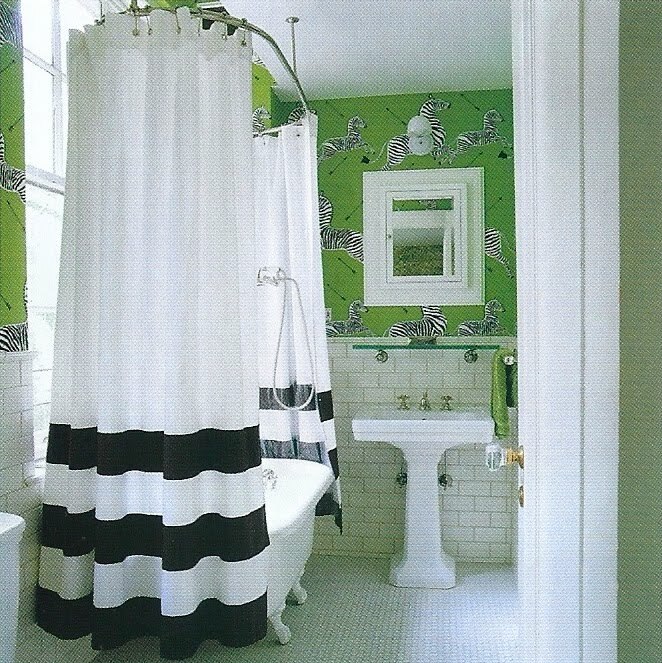 That black and white shower curtain is the perfect accent with the fun zebra wallpaper. And who could forget Celerie Kemble’s fabulous marble tub? With the addition of her armoire and the antique map, it feels elegant and old-world. From Lonny. Pretty in pink, Amanda Nisbet designed this pretty scene. I love the metallic pouf and sweet monogrammed towels. 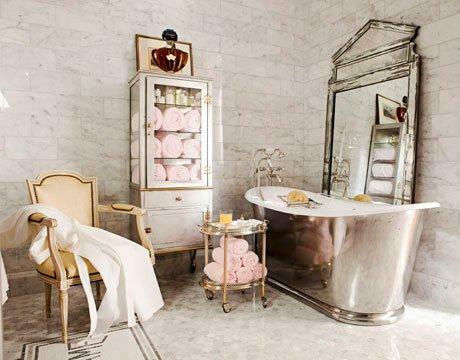 Eclectic and feminine all at once, this bathtub set-up makes my heart sing. Why not cover one wall in metallic wallpaper? 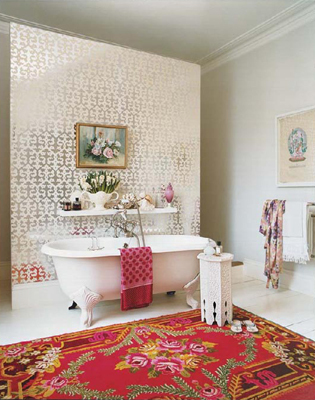 Why not put a bold floral rug in the bathroom? Photo by Francois Halard. So, which do you prefer? A sleek shower or a tried-and-true tub? There’s nothing more cozy in the fall than curling up with a magazine and a cup of coffee near a warm fire. Toss in a cashmere throw and I’m in heaven. My autumn days in Little Rock were often spent keeping warm like this, but when I moved to Texas, things changed. It just doesn’t seem to get cold here. People warned me of a “cold front” around Halloween– a weak 65 degrees. But what about my fireplace? I still love the chic look of a well-adorned mantel, and the fact that my chimney will probably never be used has not deterred me. I am still holding out hope that I might have a roaring fire come Christmas time, but in the meantime I’m seeking inspiration for my fireplace– both functional and stylishly non-functional. A sophisticated color palette and a handful of classic elements make this LonnyÂ scene a dream come true. 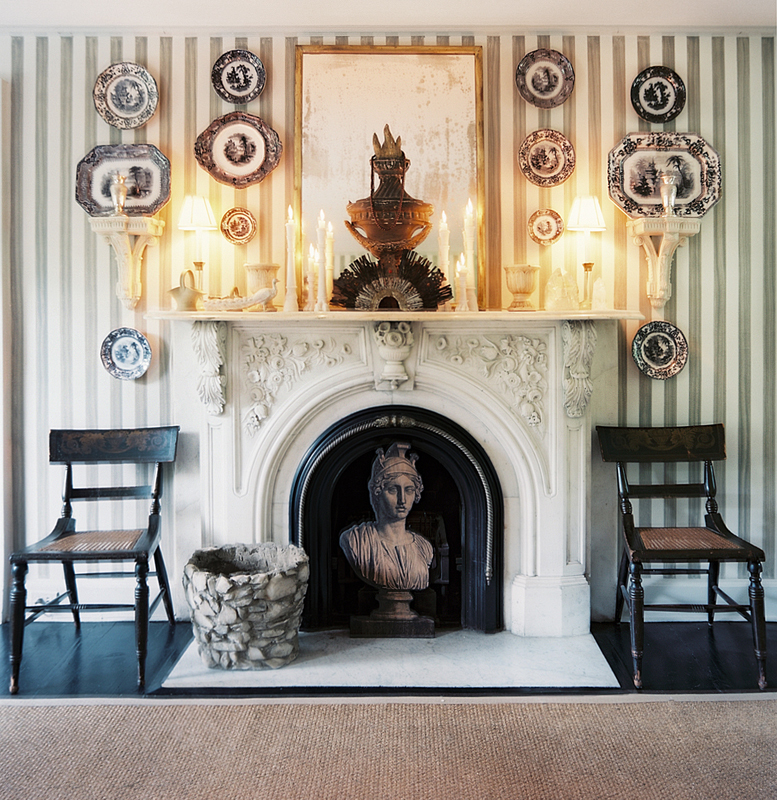 I love the bust as the focal point, and the candles on the mantel add a little romance. 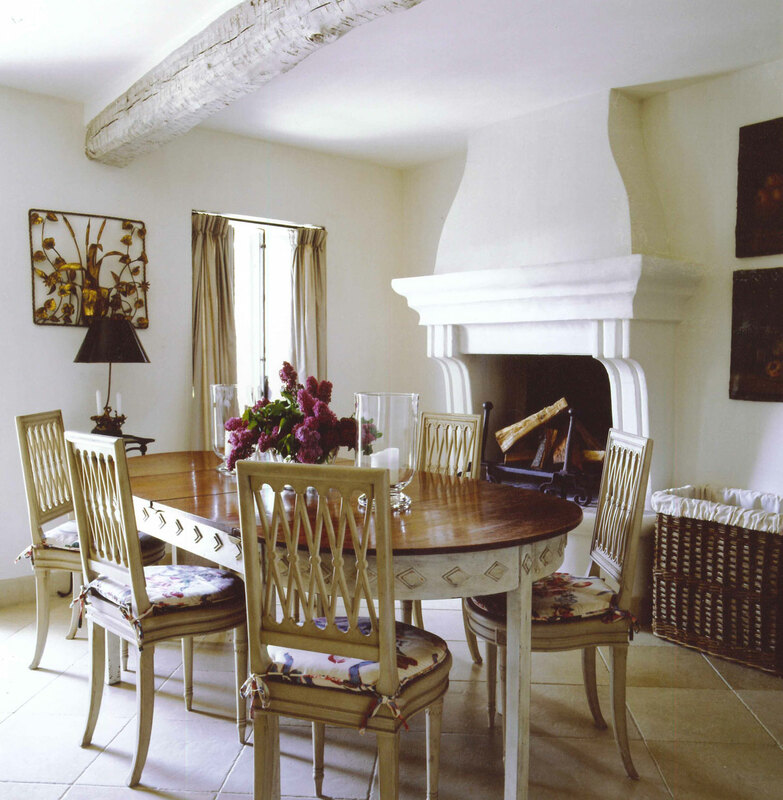 Uber-chic in the South of France, this Nicky Haslam-designed dining room boasts a fireplace fit for the coziest of days. 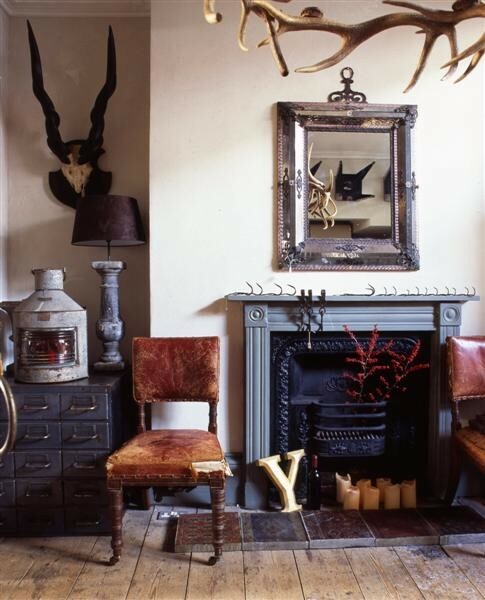 This whimsical look is right up my alley– note the grouping of candles on the hearth, the worn down antique chairs flanking the fireplace, the glamorous mirror above the mantel. Jenna Lyons’ famous closet featured in Vogue UK is a fashionista’s dream. Who needs a fire when you can have shoes?? 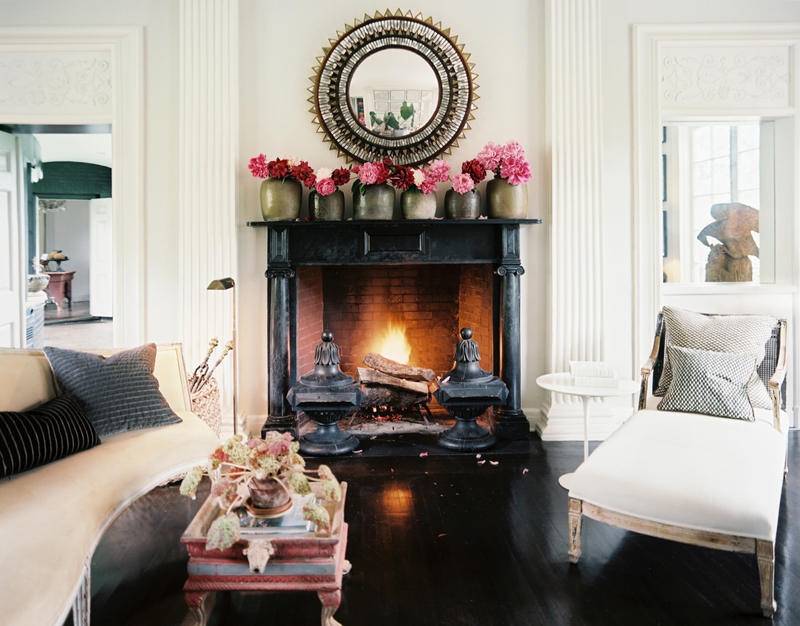 Another gorgeous shot from Lonny, this stylish setting is given a pop of color with bright blooms across the mantel. Judy Aldridge of Atlantis Home (another Texan) has given her fireplace a fabulous look by filling it with wood. It brings a rustic touch to her super glamorous sitting area. 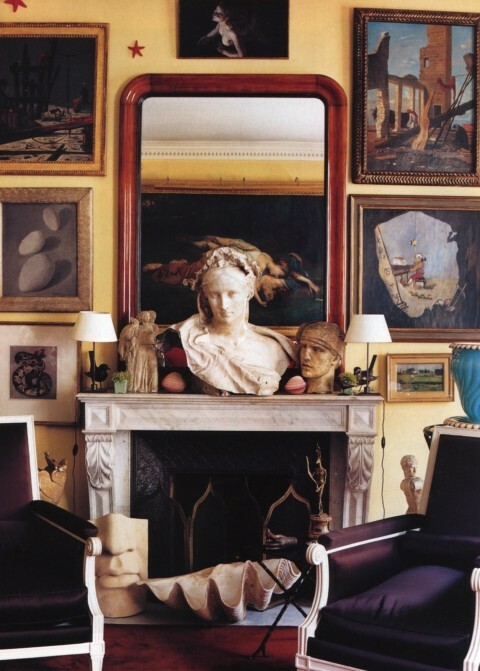 The fireplace in this picture from House & Garden serves as a gallery for worldly treasures. I love the idea of displaying a collection on the mantel. 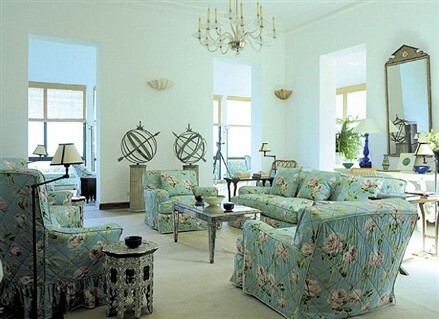 Designed by Peter Dunham via Habitually Chic, this girly sitting room belongs to Juicy Couture co-founder Pamela Skaist-Levy. 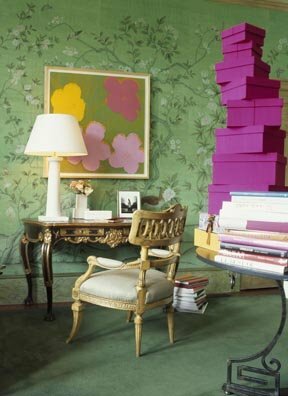 With the girly floral touches, gilded accessories and a green chair, I can’t say I’m surprised, but I am certainly inspired! Is your fireplace about form or function? Or maybe a little bit of both?? As they say, “April showers bring May flowers”, and I couldn’t be happier than to bring you a little floral fun in my post for this month. With the sun shining and blooms abounding, I was inspired to create a post on pretty posies and decadent daisies. I’m not talking about the Laura Ashley wallpaper of my childhood. I’ve rounded up some of my favorite blossomy rooms for you, both traditional and not so traditional. Enjoy!! Rita Konig’s bedroom is famous for a reason — it’s a lesson in feminine decorating without being over the top. Found on The Selby. 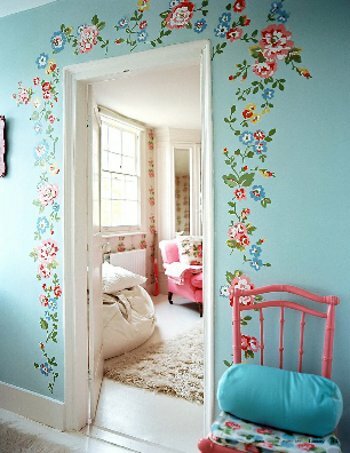 A garland of pretty blooms adorns this doorway in Cath Kidston’s house featured in Lonny. It adds a whimsical touch and I’d especially love it in a kitchen or kid’s room. Speaking of kids rooms, this one knocks it out of the park. Sara Gilbane gave this girl’s room a sweet touch with those shades and pretty pillow — very sophisticated. 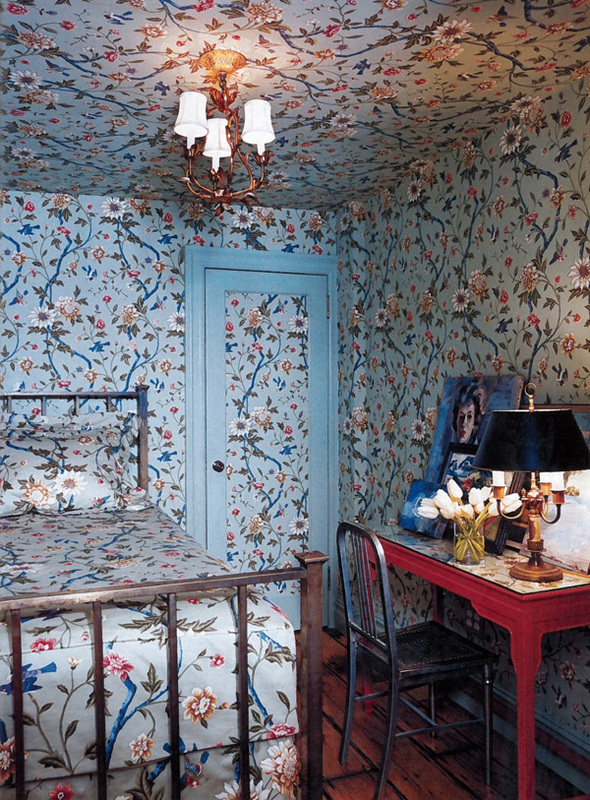 Chloe Sevigny took the floral concept to the next level in her guest room — wouldn’t you love to stay here for the weekend? Featured in House and Garden. Martha Angus set a vibrant Warhol against classic Gracie wallpaper to create the perfect blend of old and new. 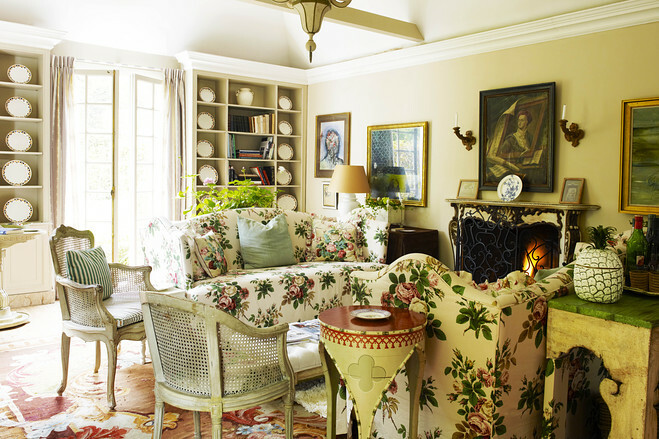 Nicky Haslam’s hunting lodge is both the subject of his new book and the object of my affection — this cozy sitting room has the perfect English look with those chintz sofas. Think he’d mind if I came for a visit? 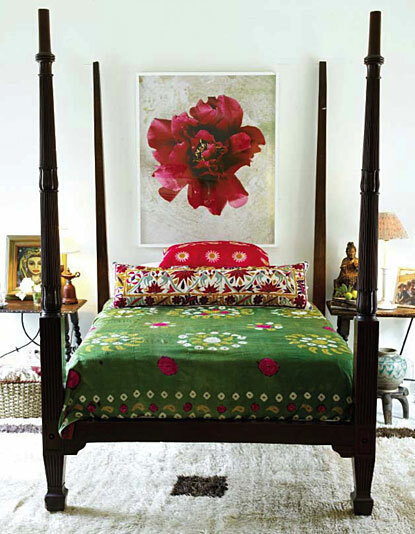 I love Katheryn Ireland’s use of exotic textiles in this bedroom and of course the gorgeous flower photograph above the bed! Such a statement. Leave it to Yves Saint Laurent to make quilted floral fabric look so chic. 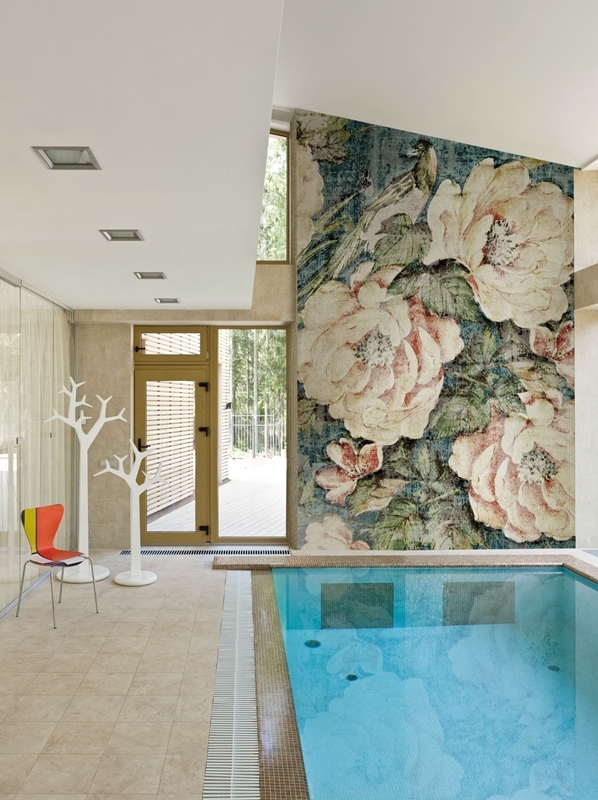 This wallpaper from Wall and Deco sure does make a statement. I love how it reflects above the pool but it would also look fabulous in a dining room or bedroom. What is your take on flowers? Will you be decorating with flora and fauna this year? Today we bring you guest blogger Cece Fourchy. The recent college grad spends her days assisting customers at Little Rock’s Yves Delorme, and her nights blogging her little heart out (check out her blog, Mississippi Maven). With our Color issue in mind, she eagerly pulled together a few of her favorite looks, not in overtly bright shades but in graphic black and white. 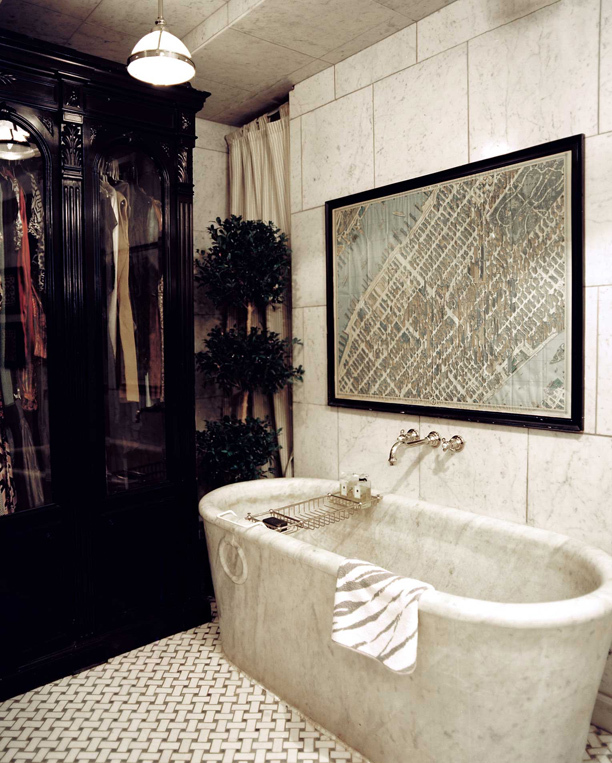 I have always loved this photo of Jenna Lyons’s bath tubÂ (in the middle of her bedroom no less! )Â from an old issue of Domino. I think the floors and all the light play down the intensity of her black walls. Eddie Ross, you’ve done it again! Lonny Magazine showcased his awesome farm house a few months ago. This shelf adds so much to his bathroom but still looks really clean. I love it! Of course, since I am making the transition from student to young professional, I’m a bit limited in choices for redecoration! But these accessories will definitely give me my fix without breaking the bank. Fabric: Rubie Green, Silhouette: Etsy, Chest: Wisteria, “C” pillow: Jonathan Adler, Mansard Rug: Jonathan Adler, Crown Pillow: Shopfurbish.com. Introducing Cece Fourchy! 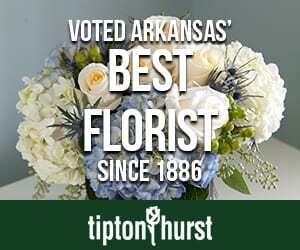 The 20-something design aficionado/blogger is now also a columnist on the At Home in Arkansas blog! Cece’s quintessentially Southern style will be showcased in her monthly blog posts, including her favorite decorating tips and trends. We’re so happy to have her on the team, and we think you’ll love her flair for accessible style. 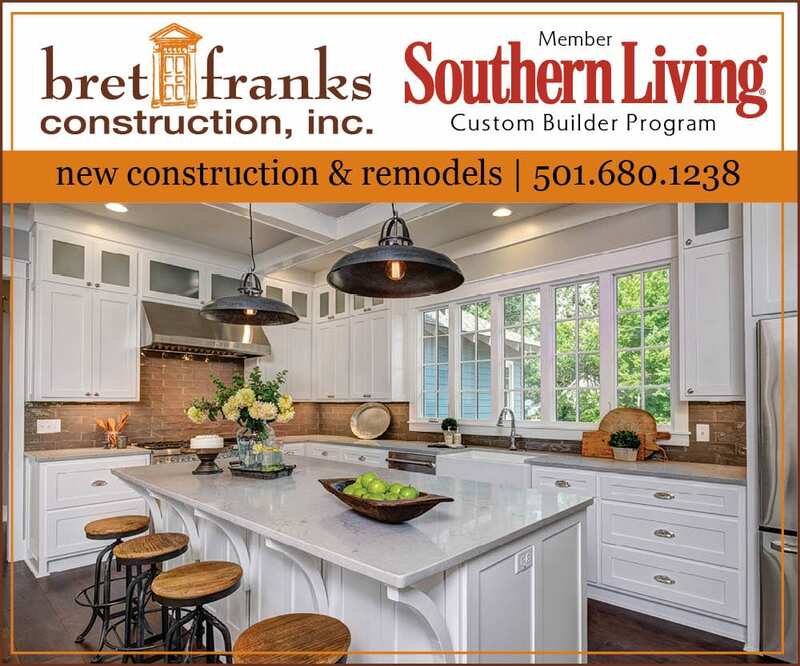 The May issue of At Home in Arkansas is all about renovation. It’s so inspiring to see the dramatic transformations of these gorgeous homes, and I couldn’t help but think about what I could do to revamp my little house. While I would love to gut my kitchen and replace my 1980s stove with a Viking range, as a 20-something just starting out that’s not exactly an option. So, it struck me: instead of transforming the structure of a space, why not transform the function? While I have the occasional guest come to stay, my guest room doesn’t serve a great purpose. So why not go old school and turn it into a library/study?? And yes, half of my interest is to be able to say “I shall retire to the study now” in an English accent. I browsed my photo files and uncovered some great shots for inspiration on my project. This workspace from Lonny looks both cozy and productive. A good desk is essential. An antique day bed, fresh flowers and good lighting: the perfect reading nook. This photo from Elle Decor is sophisticated but still inviting. Perfect combo! Do you think my eight-foot ceilings could handle that chandelier? Rachel Ashwell would be proud of this little set-up, feminine and serene. I can definitely see myself spending plenty of time in here.